For Fannie Mae or other clients (excluding Freddie Mac; click here for information on Freddie Mac MMRs), you can easily upload your MMR's into the system and add value information for historical tracking purposes. 3. Enter a Value and the Date Completed in the appropriate fields. 4. Enter any comments concerning the MMR in the Comment field. 6. At the bottom of the screen in the Notes section, click the New Note button to attach your MMR (see Adding Notes for more information on attaching documents in notes). 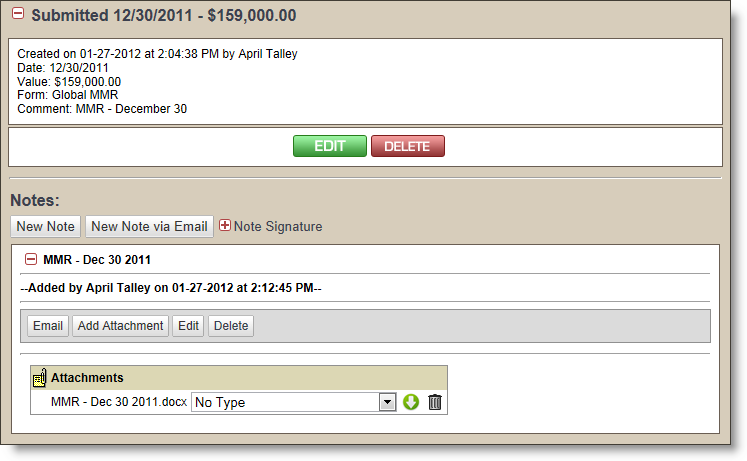 The MMR document will display in the Attachments section at the bottom of the screen, as shown below. You can use the Edit button to view or revise the MMR information as needed. Use the Delete button if you need to remove the information.